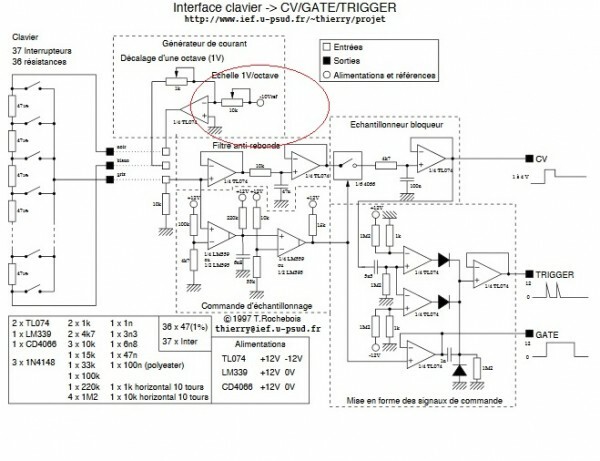 the following CV GATE TRIGGER controller circuit still puzzles me as to how to get that -10 V voltage that the section i highligted in red calls for. The whole thing works with a 12 V split supply, so my question is how and where do i get those negativ 10 V required by the current generator? despite it being french language should be easy to grasp anyway. I can't see the pic well enough to see -10v anywhere in the red circle. I am using an iPad' so that does not help. By the way, I am using the 4066 for a sample and hold circuit for my current version I am working on. 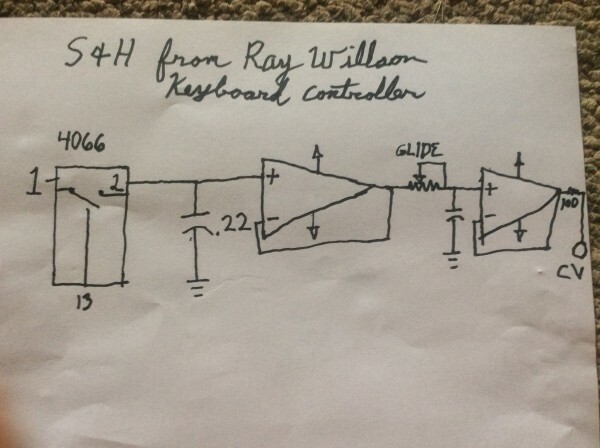 I got the idea from a Ray Willson schematic. If you are building this on perf board, don't forget the +v to pin 14 on the 4066 and the 0v ground on pin 7. Your could use a 79L10 voltage regulator supplied from the -12V (with the capacitors and possibly diodes around as suggested in the data sheet for it). Or even connect it to the -12V rail, but the 10V really is to isolate stuff a bit from the supply voltage in order to make the circuit more stable (less drift, less false triggers). This is what I was trying to add to the first schematic on this thread. However I ran into the problem that because I used a comparator for the gate signal, it always samples 0v for the sample. Working on using a simple transistor gate signal to remedy that. To Cfish,i'd like to get to the bottom of the 4066 thing, green circle. You run into some problems with it, right? What exacly happened? 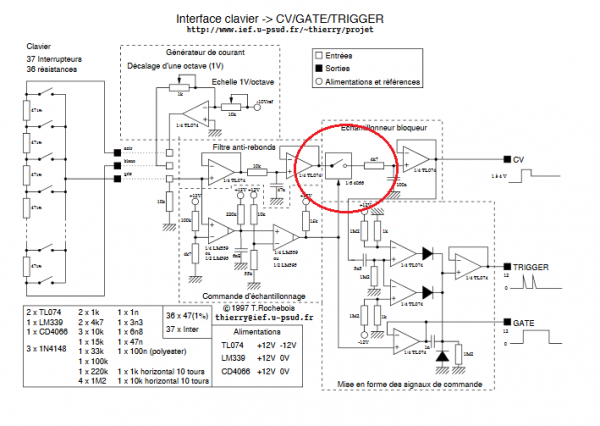 According to Yves Usson, the keyb circuit i posted has no flaws whatsoever and has been fully tested. Is it not gonna make too much heat ? Only when by accident you did something wrong .. there is almost no current flowing trough it, so it should not get warm at all. My only problem, only arose because I chose to use a comparator to get a gate signal. I didn't think about sample and hold at that moment. The problem I have, is in my own planing and design. An uneducated mans mistake. However I am learning just like anyone who isn't dead. I just try really hard to point out things fast because I don't want someone to get discouraged on my account. 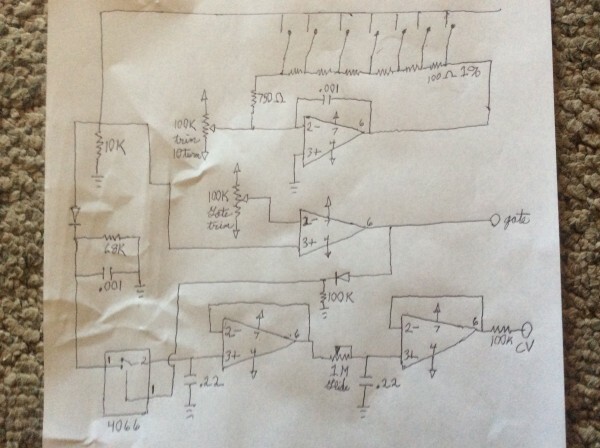 The first schematic on this page works great for what I needed it for at the time. I'm still trying to make it something better, and better. I really like this thread because almost everyone here has at one point in life wanted something better than the cigar box organ schematics. But not quite been to building a MIDI to CV converter. By the way. I have built a wonderful aurdino based MIDI to CV converter. Loosely using a Ray Willson design. I really don't need more full analog key beds. This type of circuit just intrigues me. There is a lot going on in it. But hey, if it works for you then it's alright! i am still trying to wrap my head around the basics and the old school stuff. So, despite digital being relatively easier, i like the idea of staying analog and really learn comparators, op amps,the classic analog signal manipulation and synthesis. I built the MIDI controller. However I had to have my brouther Matt program the micro. I hate that I don't understand part of what I built. That's why I'm here doing this. 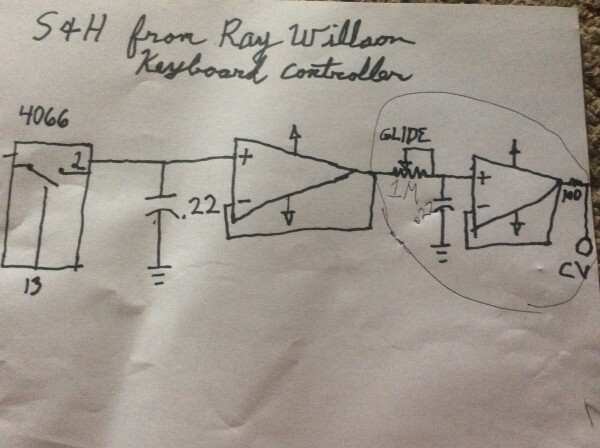 I could have built Ray Willsons keyboard design. I just couldn't figure it out. Was too much for me to understand how it worked. I like understanding it. So I break it down till I do. i also hate the idea of not understanding what goes on in a given circuit. Sadly i am a novice in electronics,i dont have a EE degree so i must rely on good schematics without being able to get what each component or section does what. Frustrating, i know,especially when it comes to troubleshooting. 4066 is just a fast switch. The capicitor after it holds the sample voltage for the opamp. This lets you pick up the key and the note stay the same. i've recently built your CV GATE circuit, and what you described ,is exactly what happened to me. Due to the lack of the sample and hold. With ADSR zero release time setting, that wasn't noticeable,but of course it was on medium or long release settings. The pic I posted above is the sample and hold I am installing. Look at your schematic you are now using and compare everything after the 4066. After the 4066 is sample and hold. Mine has glide. Didn't look to see if yours does. But glide just charges a capicitor to slow the change between keys. What type of opamp do you use on the S/H? 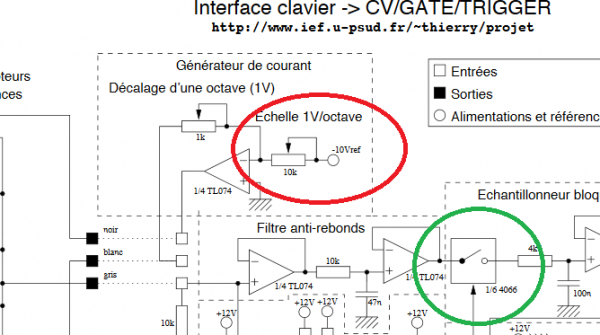 If you use something like the TL07xx that's fine, because they are FET input opamps (>> very high input impedance). But if you use the 741 type of opamp, this might pose a problem since (depending of the version of the opamp) this could have a minimum input impedance of 300kohm. Combined with the 200nF capacitor this could result in a step response of about 0.3 sec. I am using TL071 there. I built a quick rig to test the sample and hold and it works good. Took me borrowing my brouther much better scope to be sure, but it is just sampling 0v as the cv drops before the comparator swings negative. So I finally have a circuit working pretty well. With sample and hold, and glide. Tried a bunch of ideas before I settled on this. It's not perfect. However it is usable. on key drops, changes more than an octave, you get a little glide. Just a touch off the attack on my E.G. And it's not noticeable. Can't believe I didn't think of this solution sooner. The capicitor and resistor values before pin 1 on the 4066 took a lot of trial and error to find a sweet spot. i am about to build the following keyboard CV GATE TRIGGER circuit that calls for a CD 4066 for the sample and hold section. I recently got a bunch of CD 4016 ,i'd like to know if i can use it in place of the CD 4066 the circuit specifies. thanks folks ! The difference between the 4066 and 4016 is mainly the resistance in ON position, which for the 4016 is typical 400 ohms @ 15volt and for the 4066 this is 125 ohms @ 15volt. This impedance R-on is for both types Power supply voltage dependant (lower VCC means higher R-on). 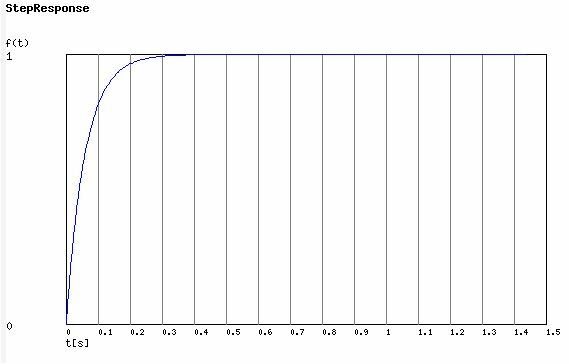 Since there is a resistor of 4k7 in series with the switch, it is ok to use a 4016 in this application, but maybe change this 4k7 resistor with a trimpot to compensate for the higher R-on of the 4016 if the slope of the CV is not steep enough. Was going to board up the schematic alanwilder81 poasted. Am curious about all the reasons for using the LM339 for the comparator in the schematic. Have ordered a few. But it's not one I keep on hand. Have been looking at datta sheet. However there is a lot in a datta sheet that I don't fully grasp yet. Would really appriciate your input.